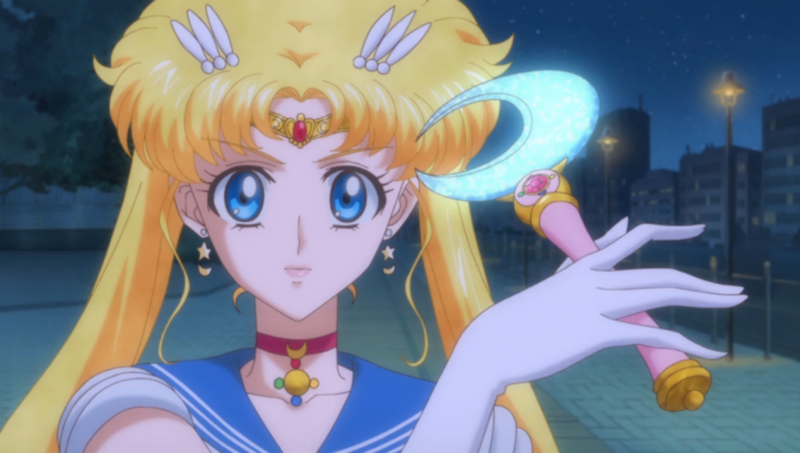 Sailor Moon Crystal Episode 7 Review | The Crystal Chronicles! 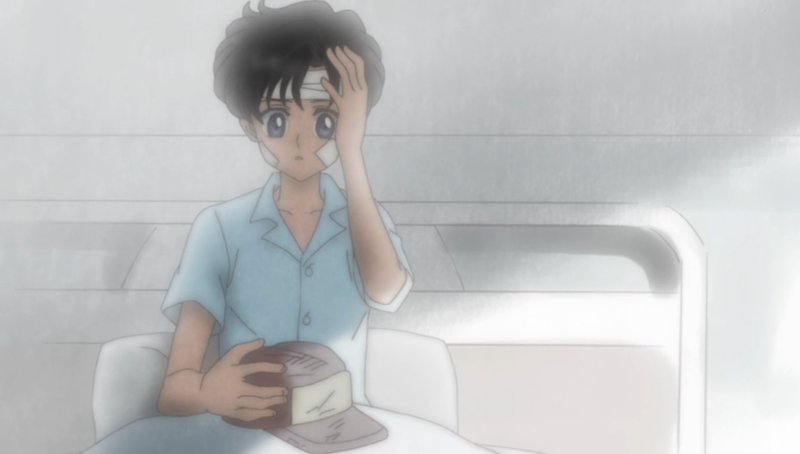 A six year old Mamoru after a car crash. Poor kid! Mamoru opens up to Usagi and tells her about his past. When he was a young boy, during his 6th birthday, he was in a horrible car crash. His parents died in the crash leaving him all alone with no memories of them. Due to his recurring dreams and feelings of not knowing who he really is, he decided to become Tuxedo Mask. In his disguise he began to search for the Legendary Silver Crystal. He believes once he has the Silver Crystal it will help him regain his memories and finally know who he really is. Mamoru tells Usagi to keep his past a secret. She agrees and they have a quiet, yet cute moment together. After a bit Usagi tells Mamoru she needs to go back home and let everyone know she is safe. 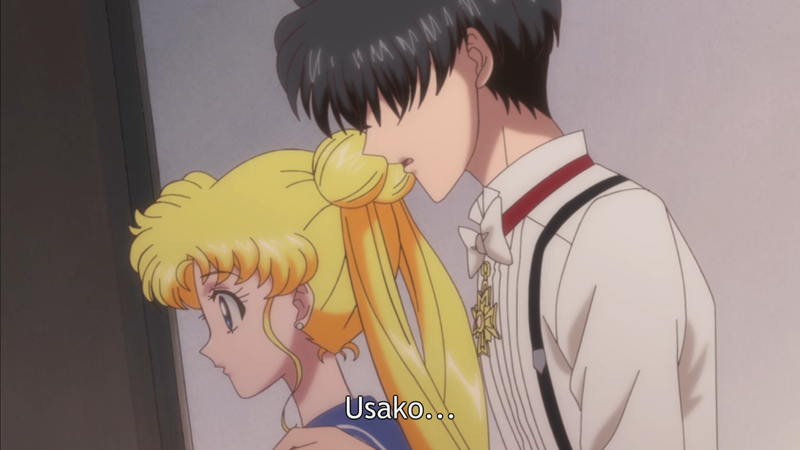 Before she leaves his apartment, Mamoru stops her and calls her Usako! Their love begins to grow more than before! We finally get a glimpse of who is really in charge of the Dark Kingdom, Queen Metalia! Queen Beryl feeds her the energy they have been gathering in Tokyo and reports to her of their progress. Queen Metalia remembers there was Sailor Senshi who attacked them many years ago, but Queen Beryl tells her it the same group attacking them again. They have fought them before? They believe the Sailor Senshi has the Silver Crystal, but they need to get it from them before the heir of the Moon Kingdom awakens. Do they mean the Moon Princess the Sailor Senshi is looking for? The Dark Kingdom will do anything that needs to be done to retrieve the Silver Crystal. Queen Beryl thinks about how she first found Queen Metalia as she worries about how she will destroy the Earth once she rises in power. One day she was at D-Point near the North Pole, she had a strong feeling to enter this castle up in the mountain. With her own hands, she releases Queen Metalia from her sealed room. Knowing what the Silver Crystal can do, she wants to keep it for herself to rule the world! She calls upon Zoisite for a new mission, to get the Silver Crystal from Sailor Moon! 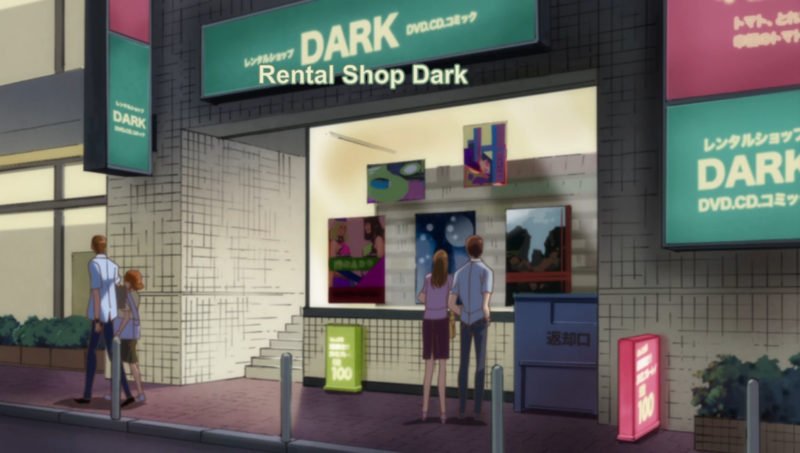 A DVD/CD rental shop named Dark, nope nothing evil is going on here…. As Rei passes by this shop, she has a feeling something evil has taken over it. All the customers who exit the shop are talking about capturing Sailor Moon?! Looks like this is Zoisite’s new plan for this episode. He must like the media! Ami has a FinePad! The best tablet ever! Usagi, Ami and Makoto are having their school lunch outside having a bit of fun. 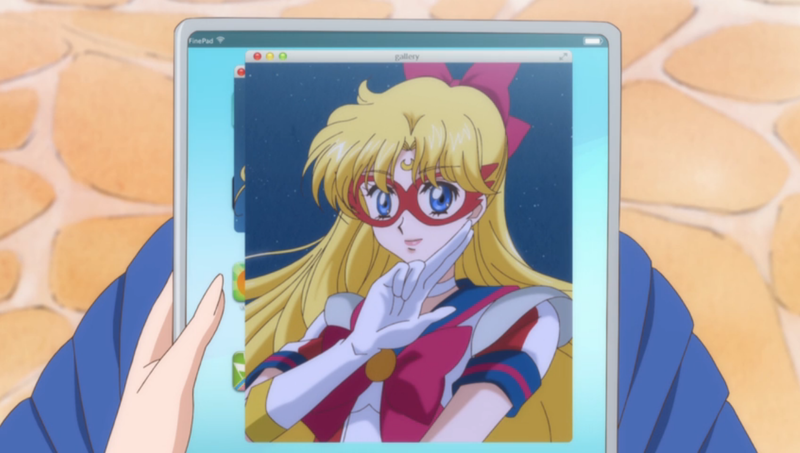 Ami did a bit of research on Sailor V, since Usagi has mentioned about her and they all play her video game…. which leads to their headquarters. No way she is connected to them right? 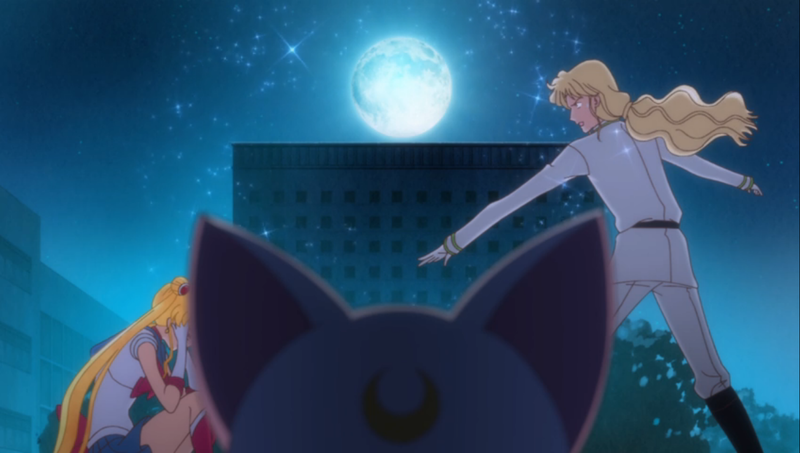 Usagi points out to the girls that she has a cresent moon on her head, so she maybe the princess they are searching for with the Silver Crystal. Umino overhears their conversation about Sailor V, thinking it was about her video game and tells them Sailor Moon is the most popular right now. He seems to be under the influence from the Dark rental shop! The girls at this moment just think he is being weird as usual. Ahh… love! The first moment they realize they love and miss each other! Ahhh!! The game character Sailor V is talking to Usagi again! Sailor V from the game warns Usagi that the DVD is brainwashing everyone who watches it. Looks like this is the newest way for the Dark Kingdom to find the Silver Crystal by telling its viewers to find Sailor Moon and steal the crystal from her. The city is full of brainwashed people looking for Sailor Moon. Makoto & Rei run around the city to find Usagi to keep her safe. While Ami is at their headquarters watching the brainwashing video to see who is behind this mess. 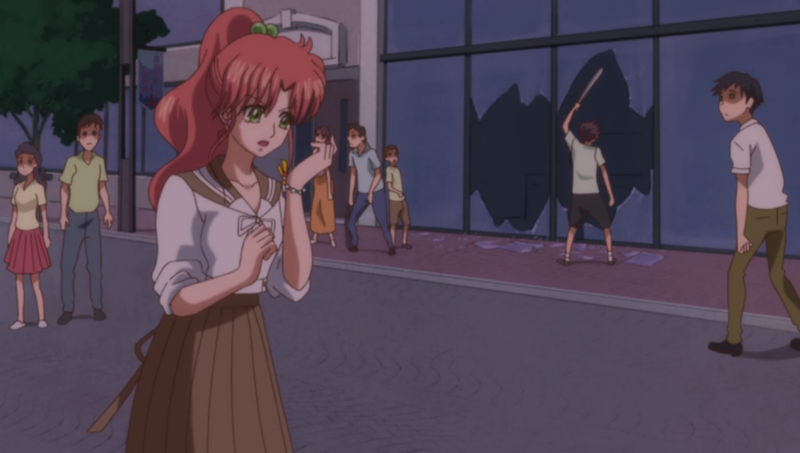 It was Zoisite trying to use the people of Tokyo again to find Sailor Moon and the Silver Crystal! Even the DVD is weakening Ami! She doesn’t waste any time! Moon Healing Escalation!! 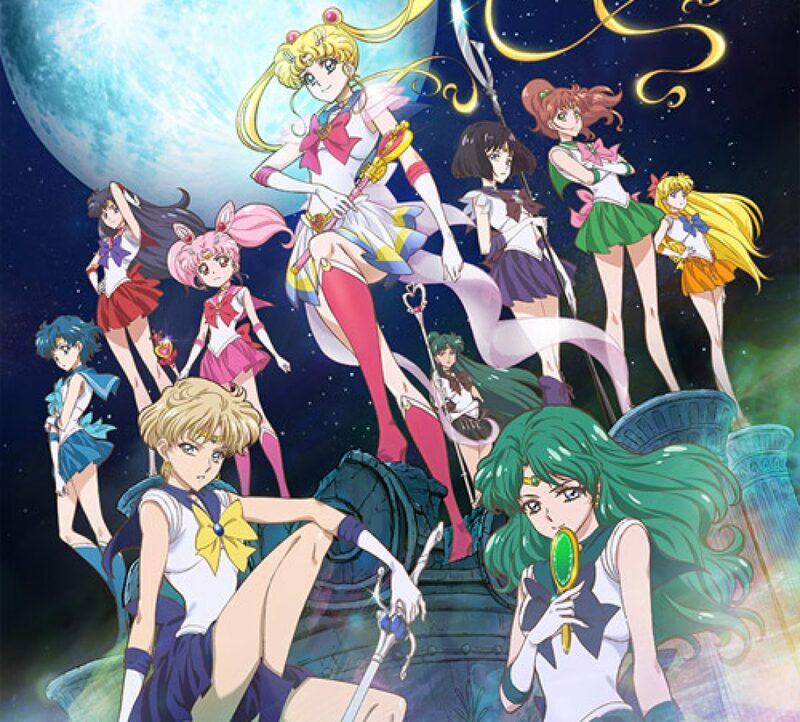 They all transform quickly, in two seconds Mercury, Mars & Jupiter transformed and ran towards Sailor Moon’s location! Sailor Moon immediately uses her healing attack to cure everyone from the brainwashing effects of the DVD. Zoisite appears to confront Sailor Moon. As she says her famous catch phrase, Zoisite stops her mid sentence and grabs her! Woa… that never happened before! He didn’t even bother to wait for her to finish! Mercury, Mars and Jupiter show up and started to attack Zoisite only for him to throw their attacks back at them. The girls are down on the ground injured! This battle is getting intense! Zoisite continues to choke Sailor Moon to get her to tell him where the Silver Crystal is until…. Tuxedo Mask punched Zoisite?! OMG! 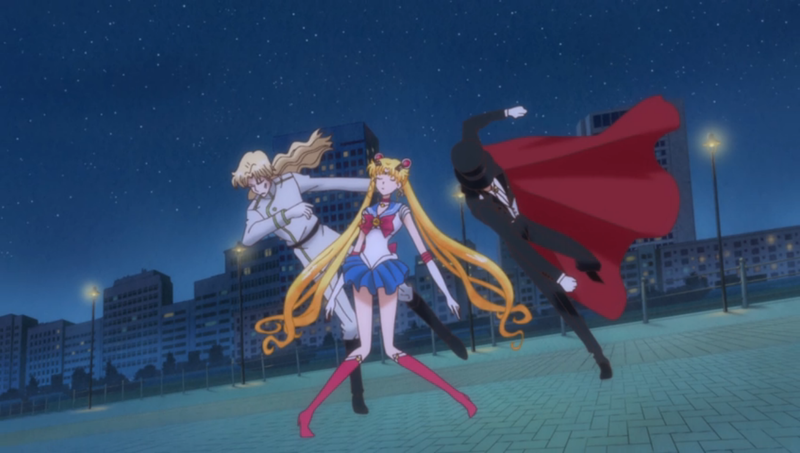 This never happened before… Tuxedo Mask punches Zoisite! Not throw a rose or hit him with his cane, he punched him! This is amazing! Sailor Moon and Tuxedo Mask have their little moment until Zoisite interrupts them. Tuxedo Mask gets angry at him and tries to punch Zoisite to only get thrown to the ground. 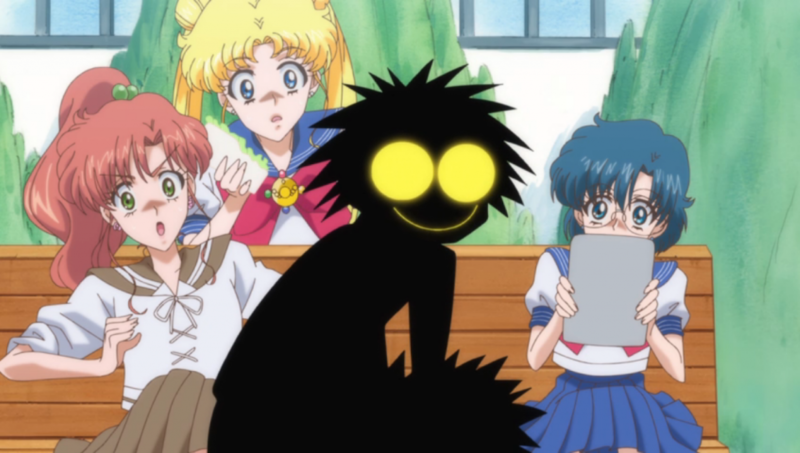 Zoicite grabs Sailor Moon again and she reveals the reason why Tuxedo Mask is looking for the Silver Crystal. Only to have Tuxedo Mask confess his love for Sailor Moon!! 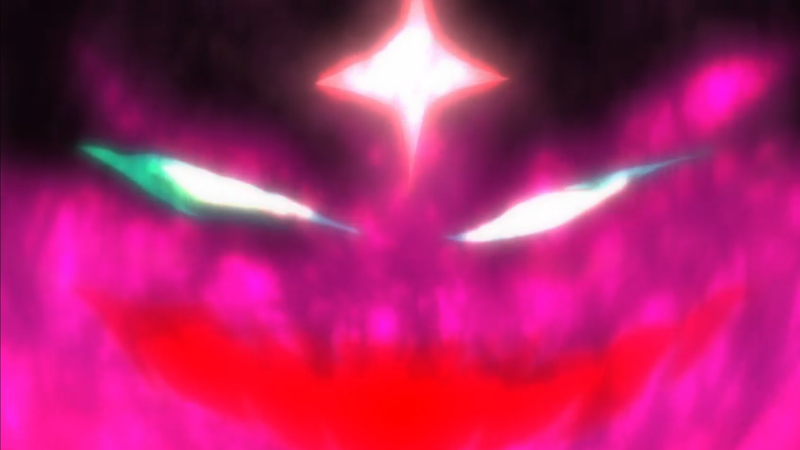 Zoisite gets angrier and decides to just kill Sailor Moon with his giant ice crystal!! Tuxedo Mask panics and runs to save her!! Sailor V? Her outfit looks different! 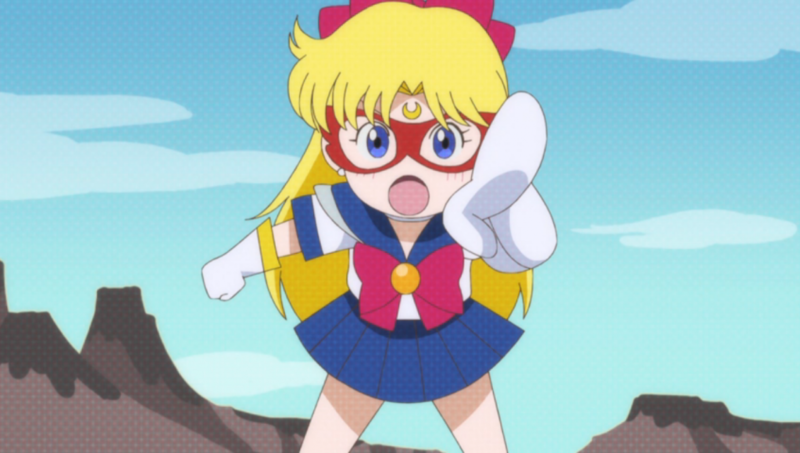 It was Sailor V who saves Sailor Moon! Her outfit looks similar to the rest of the Sailor Senshi. From behind they showed her original outfit, which now they are showing us she will be apart of their team and no longer fighting solo! Wow! This episode started very nicely and by the end it was intense! The start of Usagi’s and Mamoru’s love for each other was beautiful and cute! I couldn’t believe I ended up blushing when he called her Usako for the first time and my hear races whenever they are together during this episode. The battle scene was great! They all quickly went in and started to attack to take care of the situation quickly. Even though the girls weren’t able to protect Sailor Moon, they fought hard. Tuxedo Mask really surprised me in this episode, especially when he punched Zoisite! Even the little interactions between the girls was great to see how their friendships is growing. It may have been quickly done, but you can start to see they are becoming close friends. 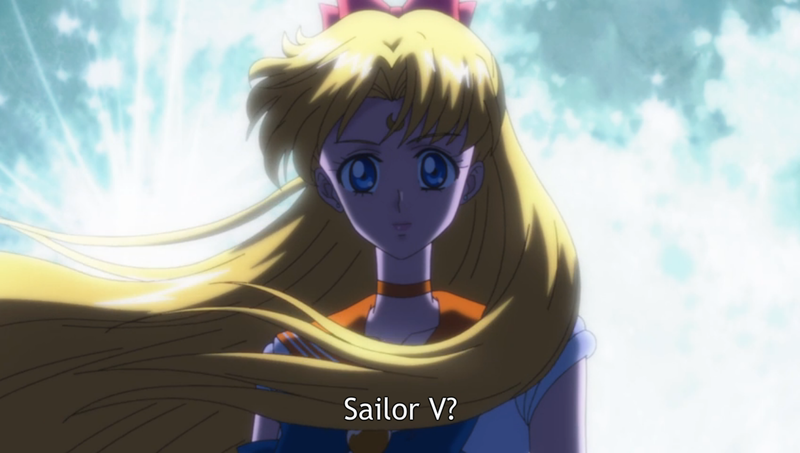 Now the final Sailor Senshi appears, Sailor V! Looking forward to the next episode and see how this battle with Zoisite ends!